Somatic rearrangements contribute to the mutagenized landscape of cancer genomes. Here, we systematically interrogated rearrangements in 560 breast cancers by using a piecewise constant fitting approach. We identified 33 hotspots of large (>100 kb) tandem duplications, a mutational signature associated with homologous-recombination-repair deficiency. Notably, these tandem-duplication hotspots were enriched in breast cancer germline susceptibility loci (odds ratio (OR) = 4.28) and breast-specific 'super-enhancer' regulatory elements (OR = 3.54). These hotspots may be sites of selective susceptibility to double-strand-break damage due to high transcriptional activity or, through incrementally increasing copy number, may be sites of secondary selective pressure. The transcriptomic consequences ranged from strong individual oncogene effects to weak but quantifiable multigene expression effects. 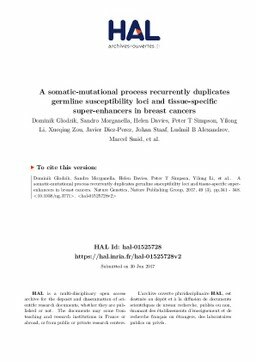 We thus present a somatic-rearrangement mutational process affecting coding sequences and noncoding regulatory elements and contributing a continuum of driver consequences, from modest to strong effects, thereby supporting a polygenic model of cancer development.